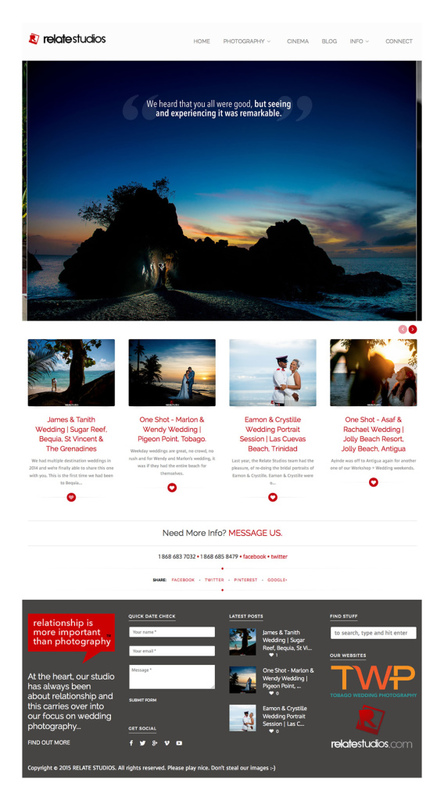 Over the past few months we’ve been working on a few of our websites, last month we launched the new tobagoweddingphotography.com and now we are officially launching our UPGRADED wedding website, itsgoodtorelate.com. Ok, so what’s the big deal? Why update the website, wasn’t the old one good enough? What are the changes? Well, even though we’ve kept some of the elements of the previous website, there are four major decisions we’ve made to make this site the best wedding website we’ve ever done, so let me give you the run down. 1. MOBILE COMPATIBILITY: With the upgrade of this site, ALL of the major Relate Studios websites are fully and 100% mobile friendly. Good thing too because Google is now using that as a main criteria for search results. We should feel the impact of that in a few months. 2. WEDDING SPECIFIC: The website is now ONLY Weddings and things surrounding weddings, (Engagements, Trash the Dress, Day After sessions etc.). Without revealing too much we are happy to say we have different plans for our other streams of photography. 2. SHOWCASING CLIENT FEEDBACK: Over the years we’ve received a great amount of feedback and in the last version of our site, we did have a testimonials section but now for the first time ever, we have matched our imagery to the powerful words of our clients and we are displaying them on the homepage of our site. 4. HIGH RESOLUTION HOMPAGE IMAGERY: Taking about the homepage, this is the biggest we’ve ever made our homepage images while still managing to keep them a at reasonable file size. They are a healthy 1600px wide, so while people with mobile devices will be able to enjoy the site, people with large high resolution screens will really see the beauty of the imagery. Of course we have other great features like a social media overlay on our images, the ability to message us and/or share the website content from almost any page, streamlined contact form, etc, etc. As always, the core of what we do is based on relationship so the site is also designed with content for you to get to know us and what we do better, so by the time you meet us you feel that you are already in a flow with the entire Relate team. Also its important to note that this site is just a one platform in a process to create something better (there are many things we couldn’t/didn’t do). We have do major plans for our weddings online. While it is by no means complete, as we still have many new posts to add, enjoy the site, give us feedback and we will improve as we build. Check out our UPGRADED WEDDING WEBSITE HERE.